You may have noticed we were a touch heavy with chicken dishes this week. As I'm working through the stock in the freezer, I noticed today I still have 2-3 pounds left... so the chicken theme may have to continue for a couple days next week! Tonight for dinner we had Spicy Chicken Cakes with Horseradish Aioli. I did have to make a slight change to the Aioli though - I was not about to buy a whole bottle of horseradish to use two teaspoons and throw the rest away, since we leave next week. Instead, I ended up using Wasabi powder mixed with a bit of water, which explains the light green hue! 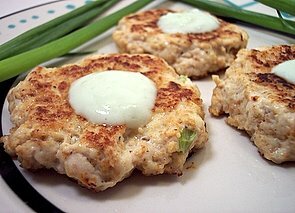 The chicken patties are a mixture of fresh whole wheat breadcrumbs, green onions, mayonnaise, cajun seasoning, salt and an egg to help hold the mixture together. I was not sure if they were seasoned enough and since I was not about to taste it raw, I took a tip from Sara Moulton and quickly cooked a small ball of the mixture to see how it tasted. I couldn't taste too much of the cajun seasoning, so I upped it some from the original recipe and then continued on. When you are combining the mixture for the cakes, be sure to not overmix the chicken - you want everything combined, but not turned to mush. The patties are pan fried just until no longer pink in the center to keep them juicy and then served with the garlicky and spicy Aioli. The Aioli recipe does not make too much, so if you like things a little saucy, be sure to double the recipe. Next time, the devil in me might be a little tempted to add a couple dashes of Franks Red Hot to the chicken mixture to kick up the heat in the patties! In an effort to use up some good quality bittersweet chocolate before the move (instead of eating it by itself that is...) I wanted something that was a bit different and a little indulgent. Mocha Wedges with Bittersweet Glaze turned into just what we wanted. Putting my springform pan to work, these rich and decadent wedges have just a hint of espresso that beefs up a deep chocolate flavor. 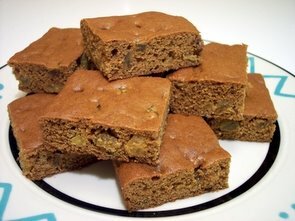 The texture of these has a crisp outside while the inside remains kind of soft, dense and almost fudge-like. 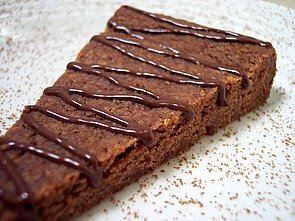 Not quite a cookie and not quite a brownie - somewhere in between. To gild the lily, a drizzle of thick bittersweet chocolate completes the indulgent factor with a sweet finish. Since we were flying high from the wedges, we went a little lighter for dinner. BLT Bow Tie Pasta Salad has the classic flavors from a BLT, minus the bread of course. Crisp torn romaine is tossed with tender bow ties, chunks of chicken breast, fresh tomatoes and salty bacon. The dressing is a light and tangy mixture of sour cream, plain yogurt, broth, barbecue sauce, vinegar and pepper. 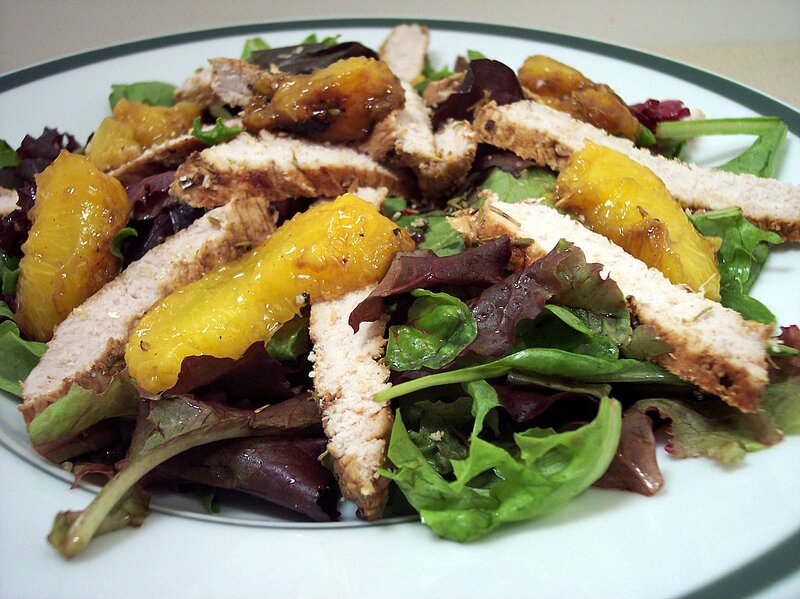 The generous amount of dressing kept the salad moist and brought an interesting flavor twist. 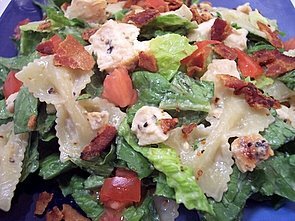 I kept a portion the romaine mixture separate from the dressing so we can have the leftovers for lunch tomorrow - the full recipe makes quite a bit, but I can see us making this again and again for picnics or barbecues. Back a few years ago, our diet pretty much consisted of chicken fingers, fries, or probably pizza. We were pretty picky and didn't stray too far from that selection. Since then, we have really branched out on the variety of foods we will try and we now tend to eat pretty healthy. Sometimes, though, one just wants to have something comforting and familiar - especially during stressful times. Before, the chicken fingers certainly would not be coated in almonds and whole wheat flour... and the fries were definitely deep fried. Instead of going back, tonight's dinner gave us what we were craving - but without the guilt in the morning. 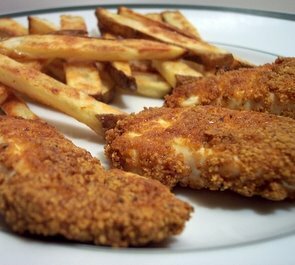 Almond-Crusted Chicken Fingers are coated in a mixture of almonds, whole wheat flour, papkria, garlic, mustard powder, salt, pepper and cayenne. Instead of leaving this spicy mixture dry, olive oil is drizzled in while it is being processed to give an indicative golden hue that is sometimes lacking in other baked recipes. The nutty coating stayed intact when they were turned over and added a crunchy texture to the moist chicken. The combination of spices complimented each other and brought a friendly level of heat. There is not really much of a recipe for the fries. There are a couple key points though that I found to really help make them tasty. One thing I like to do is soak them in water to draw out some of the starch - you can use cold water, but they will need a longer soaking time. I use a tip I found from Cooks Illustrated that if you use hot water, they only need to sit for about 10-15 minutes. While I dry them off, I preheat a lightly oiled pan for about 5-7 minutes in the oven. 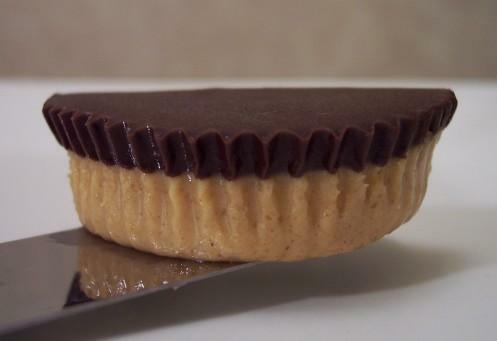 If you do this step, as soon as they hit the hot pan, they will start to form a crust and will not end up sticking or tearing apart when you go to turn them over. I coat the dry fries with a couple splashes of olive oil and season with salt and pepper. I flip them halfway through and in about 30 minutes you have golden crisp fries that are still tender and moist on the inside. Don't forget to season them again while they are still pipping hot from the oven. For these two recipes, they are cooked at the same temperature so they will be done at the same time if you start the fries a few minutes before hand! Fresh cranberries... well they were frozen fresh! Yes, the treats are still being made for Jeff's previous co-workers! Next Wednesday will be the last treat day for them as we won't be here anymore the week after. The treat for Wednesday Treat Day may be a little unseasonal, but there was no way I was going to let cranberries from the freezer go to waste! I always buy a few extra bags during the cranberry season and stash them for summer treats. 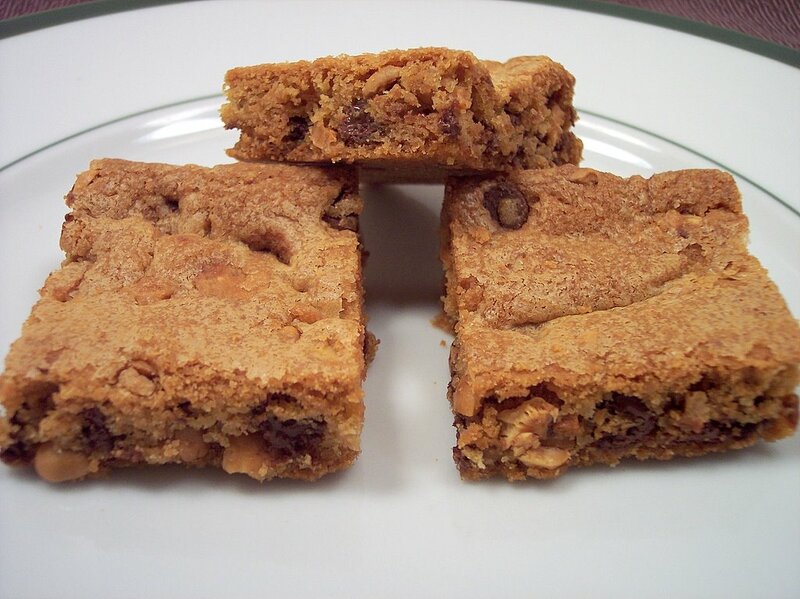 Today's recipe is a bar cookie - Orange Cranberry Nut Bars. 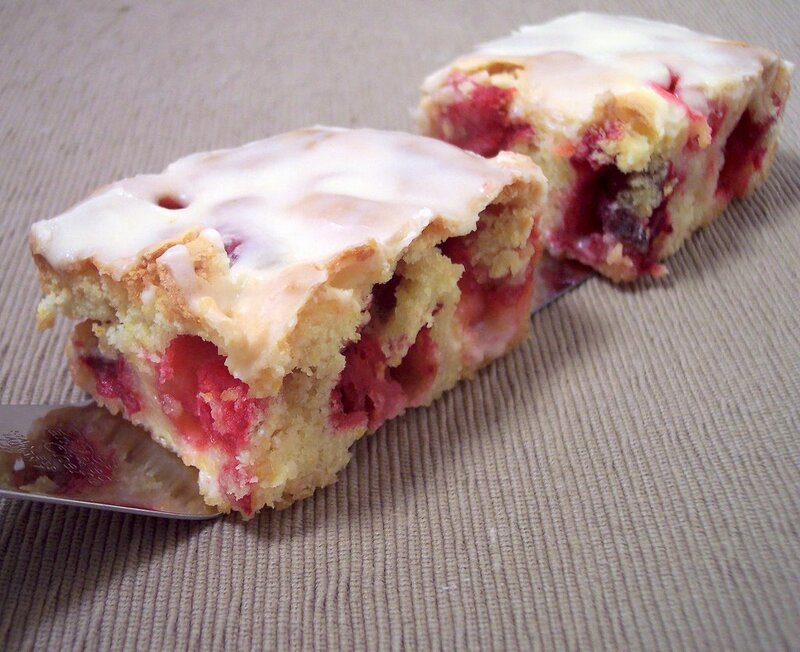 Inside these moist bars are whole cranberries with sliced toasted almonds scattered throughout. The eggs are the only leavener in the recipe, so the bars are a bit dense - but they do rise a little though. Fresh orange zest adds a zing to these slightly sticky and sweet gems. While these bars do not need anything else, a glaze made of powdered sugar and orange juice coats the top with just enough sweetness without being too over the top. 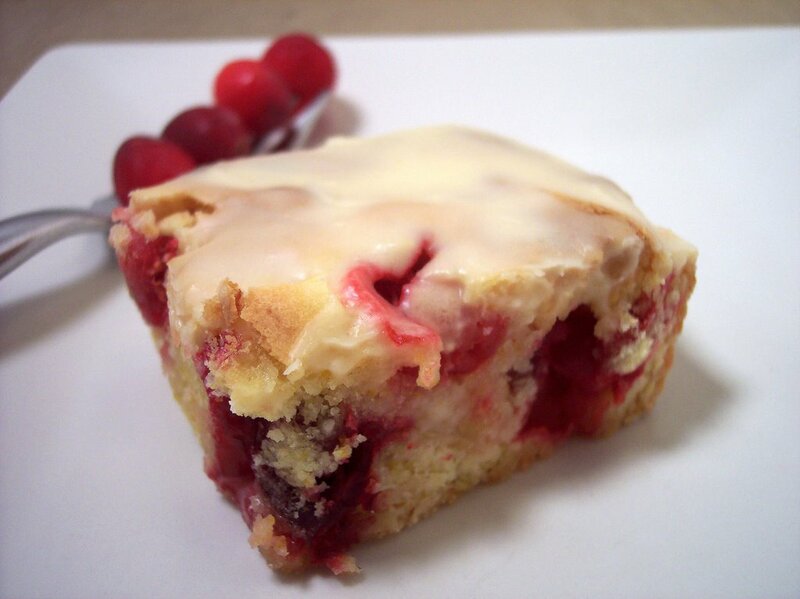 When you get a piece that has a cranberry still intact, the fresh burst of flavor that fills your mouth makes your tastebuds stand at attention wanting more of that tangy bite. 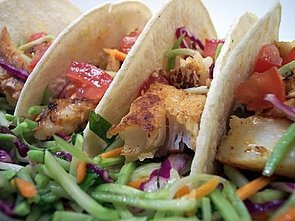 We had such a fun and hands on dinner tonight - Fish Tacos with Broccoli Slaw! The original recipe called for cabbage slaw, but we really like the crunch and taste the broccoli version gives. These fresh tacos start with a layer of juicy slaw flavored with lime juice, olive oil and salt. Cod that was seasoned with smoky chili powder and salt is pan-fried just until the firm fillets start to flake. 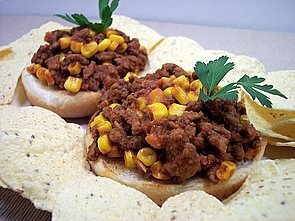 They are then chopped into bite-sized pieces and arranged evenly over the warmed corn tortillas. The tacos are rolled up and finished with a scattering of chopped fresh tomatoes. Because the slaw mixture makes more than you need, it is served on the side as a small crunchy salad. 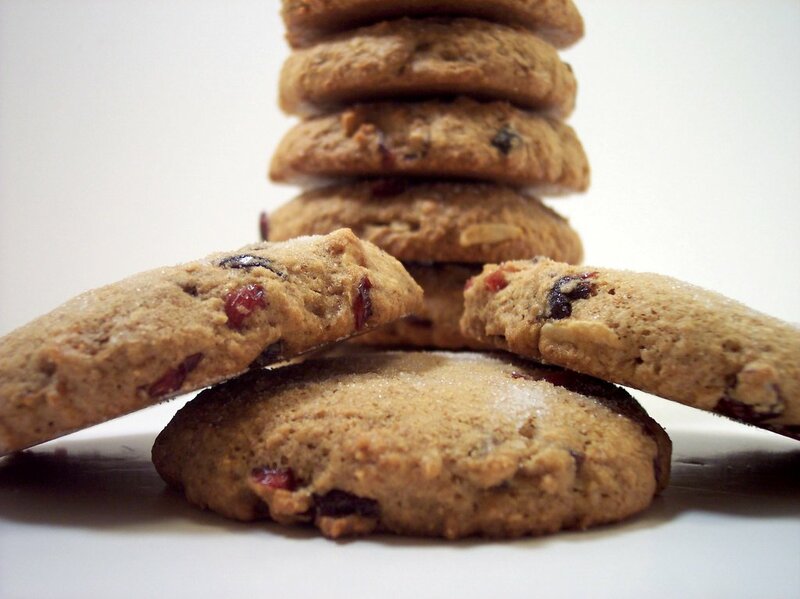 Big, thick, healthy cookies... and they even taste good! I've been looking for a recipe that would work for a quick breakfast on the go or a substantial midday snack - I think we've found one that we both really like! 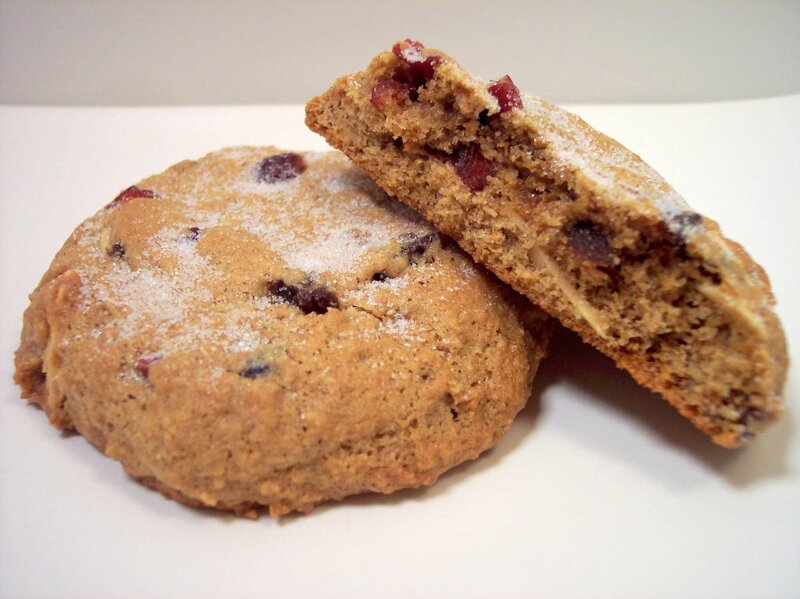 Breakfast Fig and Nut Cookies uses a mixture of whole wheat flour, all purpose flour and wheat bran. They are packed full of chopped mission figs, dried cranberries and toasted sliced almonds. Lightly spiced with cinnamon and allspice, they have a slightly sweet and wholesome taste. They are a little hard to describe texture wise, the best I can come up with is the cookies are like a muffin top that meets a sturdy cookie. They are not melt-in-your mouth cake-like, but not chewy/crisp either. There is a healthy flavor to them, but definitely not in a bad way. The cookies are almost 4" across and 3/4 of an inch thick! I want to tinker around with the recipe to try to add oats for some texture, and test other fruit combinations. I was going to use turbinado sugar on top, but glad I stuck with the granulated. I think with these golden cookies, the smaller grains scattered on top work better than the chunky raw sugar. Keeping the fig theme of the day going, we had Chicken with Balsamic-Fig Sauce for dinner tonight. The chicken is seasoned with thyme then seared off just until they are no longer pink in the center. To the bits left in the pan, balsamic vinegar along with chicken broth, soy sauce and chopped mission figs are added in. As the mixture bubbles away, the figs plump up by soaking in the deep flavorful mixture. Meanwhile, the chicken is cut into long strips and when ready, the warm mixture is spooned over the top. There is quite a bit of sauce, so I think this would be great served over brown rice to absorb the tangy drippings. Lots of flavors and textures happening for such a quick dish. I made Cumin Potatoes as a side for dinner, but alas - no figs hiding in this! 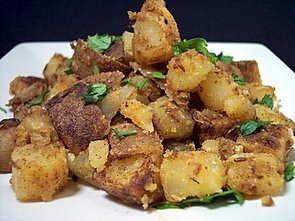 This one starts out by boiling chunky russet potatoes until tender, but not falling apart. They are then quickly rinsed in cold water to halt them from continuing to cook. To enhance the cumin flavor, the seeds are quickly toasted with some oil in a hot skillet. The potatoes along with other seasonings are added in and left to form a rich crust. After a couple quick flips, they have a warm moist interior with a crisp outer coating. We had a hard time trying to stop at one serving each! 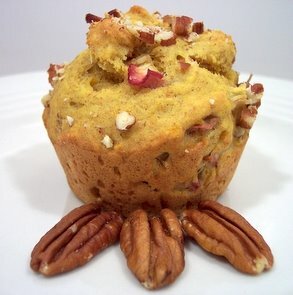 *I also updated the recipe section to the left today - you may have to hit refresh to see the additions! Well, the stress level is rising! The packers are coming to box everything up in under 11 days.... time is going by fast. We are still waiting for a contract on the house here in Phoenix since the first one fell through, but we have had quite a few showings this past week. I hope we get something going before we have to leave an empty house behind! At least I can keep myself busy in the kitchen - we made 11 new recipes this week. The standouts for us would be the Roasted Garlic, Tomato, and Basil Squares and Dark Chocolate Raspberry Breakfast Muffins. It is wicked hot here today... even though it is cloudy this afternoon, it got to almost 115. Not fun when you need to get your grocery shopping done! I would usually post a picture of something we plan on using this week, but instead I'll talk about something icy cold I just made to try and get some relief from the heat. 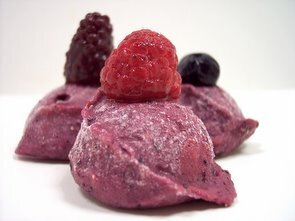 Easy Fruit Ice Cream is not a true ice cream, but it is dead easy and boy did it ever hit the spot. This is a mixture of vanilla soy milk, powdered sugar, a small box of instant pudding mix and a ton of frozen fruit. I used a combination of blueberries, marionberries and raspberries and the pudding was a white chocolate mix. All of the ingredients are placed in a food processor and in just a minute you can enjoy the smooth concoction. The instant pudding mix adds some flavor, but also provides a creamy mouthfeel and helps to keep that "icy" texture from forming. Right out of the processor, it was at soft-serve consistency and easily held its shape. I used a cookie scoop to show how it held its form, but I did place these in the freezer for a few minutes so we could take a picture without them melting. 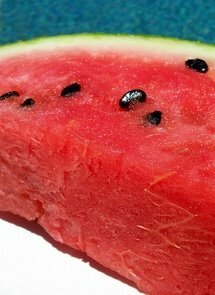 If you do prefer a more firm texture, scoop it into a bowl, cover and place in the freezer for about 15-20 minutes. Ahh... I feel much better already! I've been wanting to use some more rhubarb since we made the Rhubarb Pudding Cake a few weeks ago. I thought about maybe a crumble or pie, but I wanted a more individual snack... so I went with muffins! Rhubarb Crunch Muffins have a moist and tender interior with a crunchy crown from chopped pecans. Freshly squeezed orange juice helps to cut the tartness from the unique tangy rhubarb and adds a sunny sweetness to these golden treats. I would normally toast the pecans before hand, but since they are scattered on top of the raw batter, they are exposed to the heat long enough to get that toasty flavor. Tonight's DVD for the weekend from Netflix is Ray with Jamie Foxx. As the move gets closer, I am trying to be more diligent with the menu planning to get things from the freezer and pantry used up. I will be going through some cookbooks and recipe piles tonight and see what we can dig up for this upcoming week.... until tomorrow! 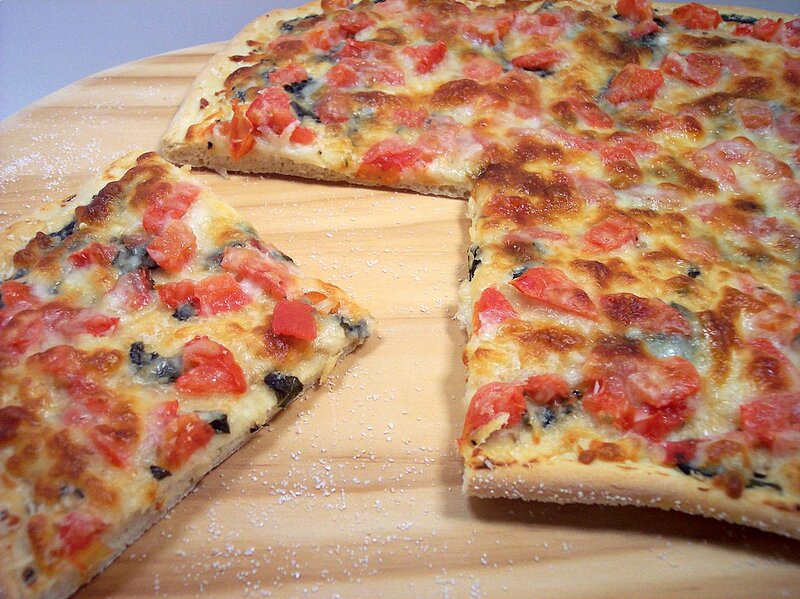 It is not often that we have pizza and when we do it is usually something pretty different. But after tonight's version, I can see us making this recipe a few more times! 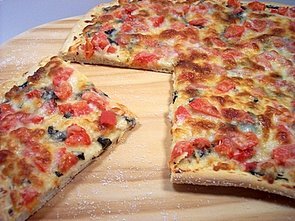 Roasted Garlic, Tomato, and Basil Squares has a not too thin, but not thick crust, that is crisp on the outside and chewy on the inside. 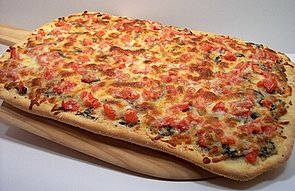 The homemade dough was a pleasure to work with - it was elastic enough that I was able to easily stretch the dough into the large rectangle over the crunchy cornmeal instead of rolling it as the recipe called for. If your pizza stone is large enough, just prepare the dough on the peel instead of using a baking sheet... but alas ours is a smaller round one. Before the dough is placed in the oven, a light coating of olive oil in brushed on to add a bit of richness to the dough and to ensure a golden color. After the prebake, the crust is smeared with a daring mixture of soft roasted garlic, tangy mayonnaise, fresh basil, salt and pepper. Very ripe fresh tomatoes are chopped and thrown over the spread. 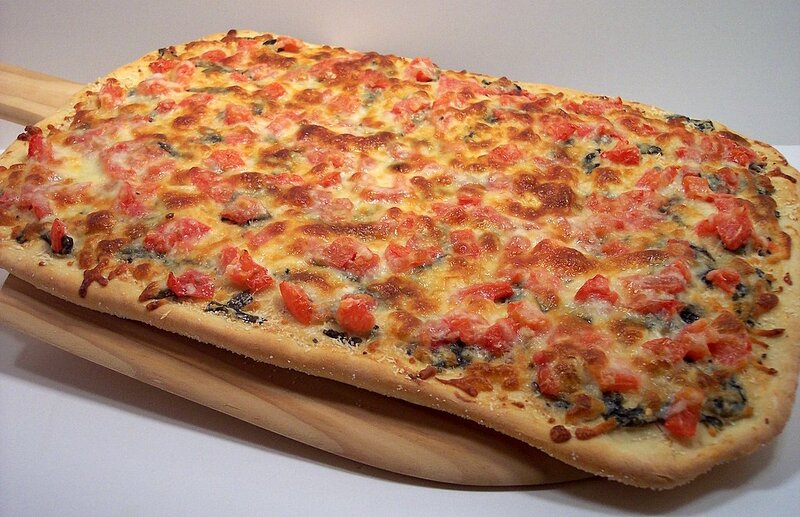 To finish, sharp Parmesan and shredded mozzarella are scattered on top and then the heavy slab of tantalizing flavors is placed back in the oven to soften the tomatoes and create that appealing golden finish to the cheese. This was suppose to sit 10 minutes before cutting... ummm yea... right - our mouths had already started to salivate from the smell alone coming from the oven! 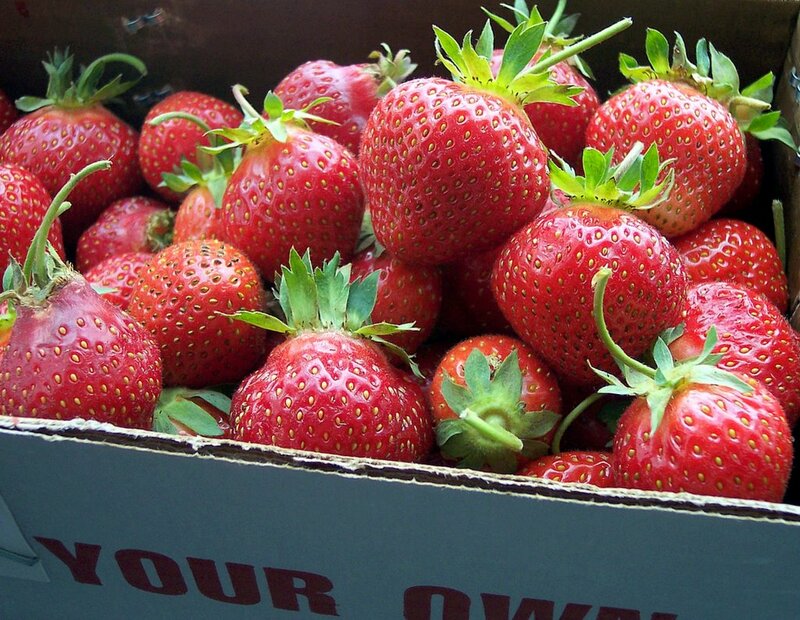 Fresh, sharp and delicious - not much else to say! Rice Krispie squares are always a favorite classic treat, but sometimes adding just a little something else takes them to a whole new level. 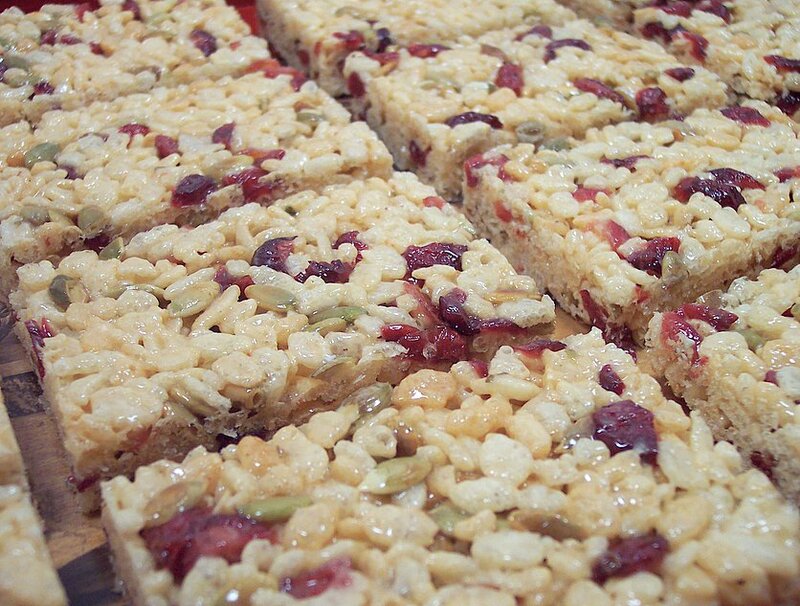 Green Pumpkinseed and Cranberry Crispy Bars add a sweet and salty twist to the plain ol' bars. To enhance the flavors of the seeds, the pepitas are toasted in a dry skillet until they begin to pop and turn a light brown. You continue on as you normally would with the melting of butter and then the squishy marshmallows. 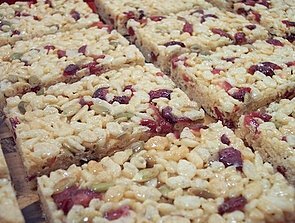 When ready, the cereal, toasted pepitas and dried cranberries are mixed together with the melted marshmallows. Then you press the mixture into a baking dish, but be sure not to press too hard as you want an element of airy-ness to them. Coat your hands with cooking spray or a bit of soft butter to keep the sticky mass under control. Crunchy, chewy, sweet and a hint of salt make these excellent for such a simple combination of commonly on-hand pantry ingredients. Chilaquiles Casserole is also the first time we have made anything with enchilada sauce! 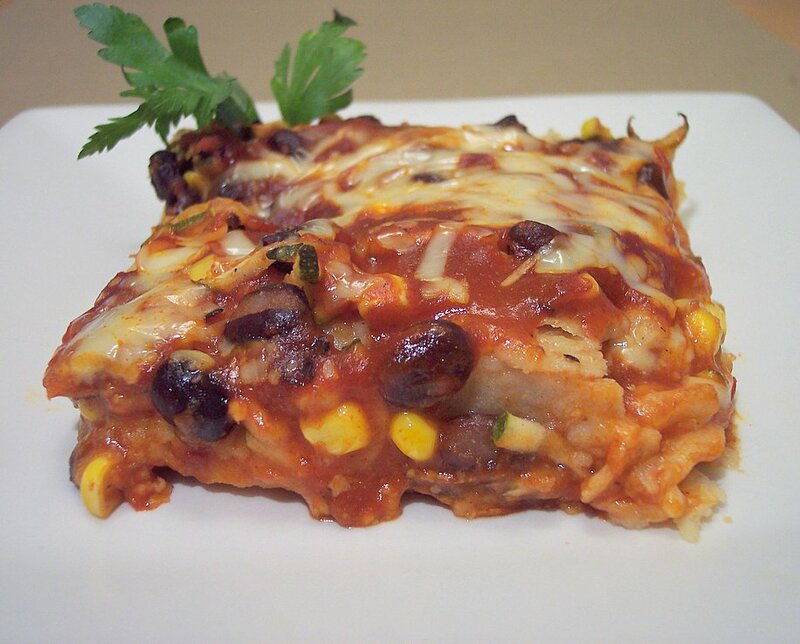 Quartered corn tortillas are layered with a jam-packed vegetable mixture of grated zucchini, onion, fresh sweet corn, black beans and fire roasted tomatoes. Since we tend to like things on the fiery side, I mixed hot enchilada sauce with a mild and Jeff rated it still quite high on the heat scale. If you want to forgo the heat altogether, use some tomato sauce instead. Sharp white cheddar cheese can also be found in the middle layer as well as being the final topping. 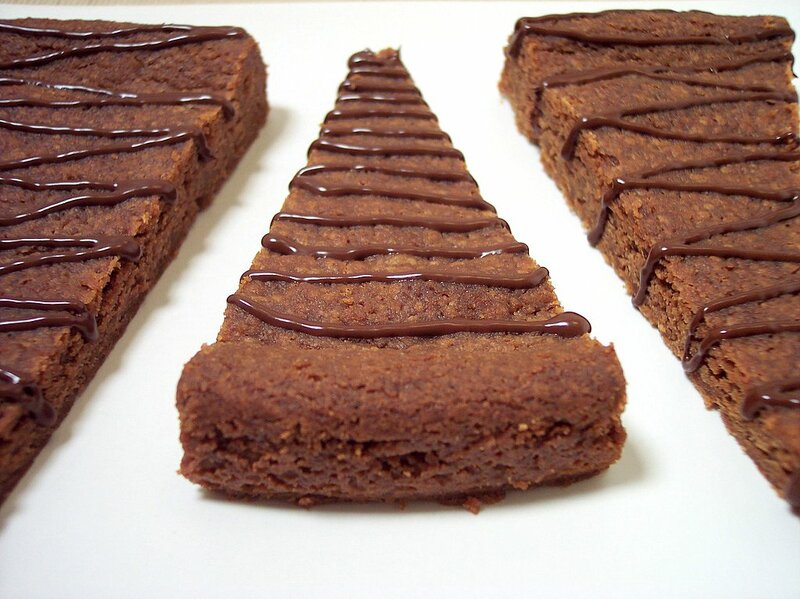 After it is baked, the mixture is allowed to rest and then can be easily cut into squares. Cumin added a subtle smokey flavor to the vegetable mixture, which brought such a fresh taste to the spicy sauce. I can't wait to see how the flavors marry overnight when we have this for lunch tomorrow! The last few times we have done tofu, it was more down the list of ingredients rather than being the main portion. 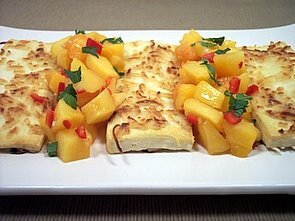 Tonight's dinner on the other hand, uses tofu steaks dipped in a flavorful coating and then simply pan-fried as the star ingredient. 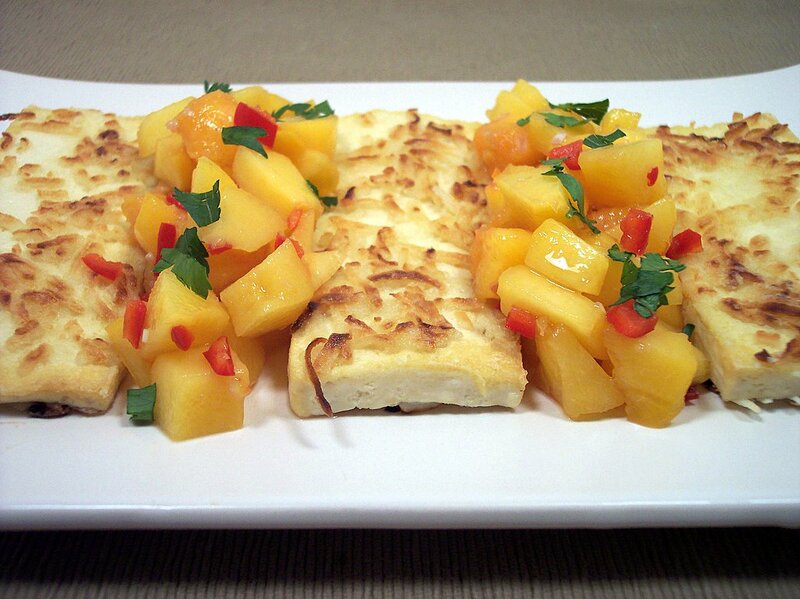 Coconut-Crusted Tofu with Peach-Lemongrass Salsa begins by making the bright spicy salsa. 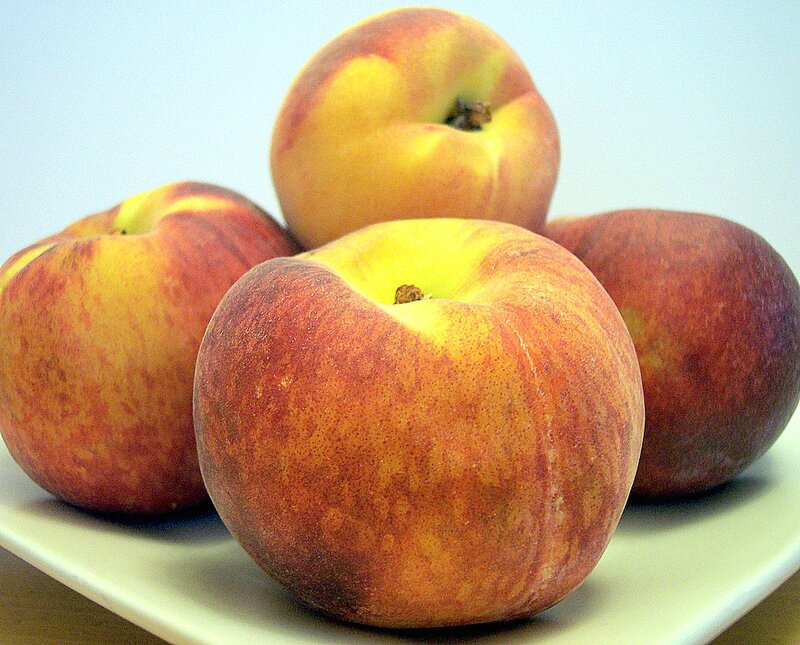 Fresh chunky pieces of peaches are mixed with red jalapenos, fresh lemongrass, basil, brown sugar, vinegar and salt. If you prefer this to be more mild than spicy, be sure to de-seed the jalapenos. The tofu is cut into steaks and then coated in a mixture of unsweetened coconut, flour and cornstarch to create a crisp golden crust. Jeff thought we should have added a little more of something to the coconut mixture, as the tofu was still kind of bland... but this was somewhat expected as the only seasoning was salt. We did both agree that the blandness was a good match for the sweet lemon scented salsa. When you drain the tofu, be sure to use a few layers of paper towels to get out as much extra moisture as you can for a firm texture. Very fresh, healthy and a fairly quick weeknight meal. Jeff was suppose to fly out to Frederick today for work, but the trip was cancelled... so we will have another Wednesday Treat Day for his former co-workers! This treat, Dark Chocolate Raspberry Breakfast Muffins, are dark, rich and decadent muffins that could easily be a dessert on its own. 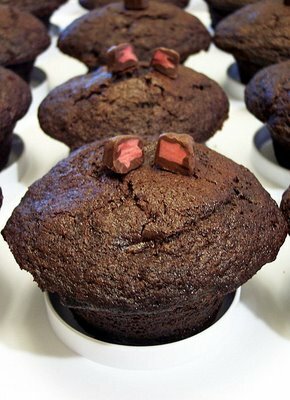 The muffins are tender, rose fairly high and have a deep chocolate color. 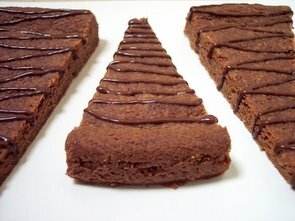 I used Dutch-process cocoa which darkened the color and brought a smooth chocolate flavor - if you only have natural cocoa though, feel free to use it in this recipe. Instead of using chocolate chips, I used raspberry creme filled dark chocolate chunks. They look a little ordinary on the outside, but as you take a bite you find that the chocolate chunks turned into creamy pockets of a mild raspberry flavored surprise. You could take these over the top and spread on a thick fudgy icing turning these into wickedly sinful chocolate cupcakes. You certainly don't have to eat these for breakfast, but oh what a way to start the day. Tonight's side dish is a pared down potato salad. 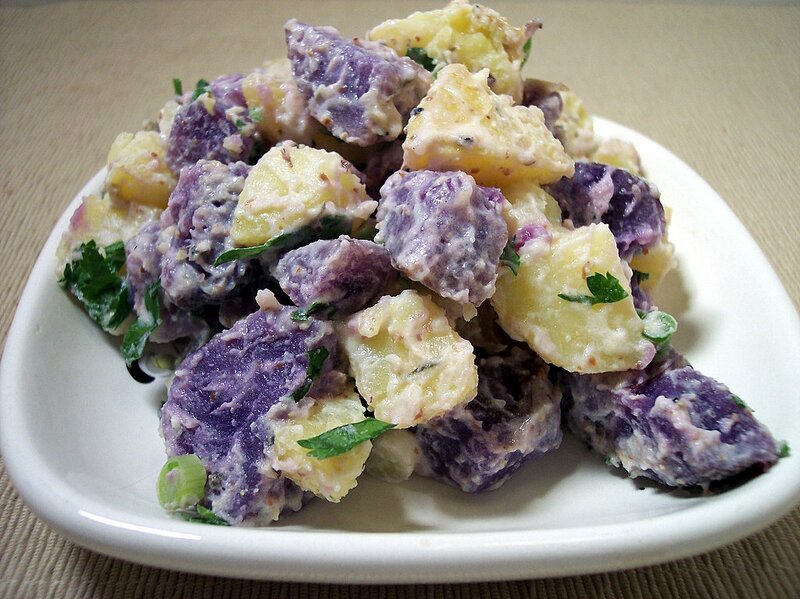 The recipe, Yukon Gold Potato Salad, called for using only one kind of potatoes, but I used half yukons and half purple potatoes to add some fun color. Besides, we found them at a great price in the market this week! I did leave the peels on, but if that bothers you, feel free to take them off before mixing them with the dressing. The vinegar in the dressing was a little strong, so I might add a dash of sugar next time. There was a good amount of creamy dressing to coat the tender potatoes - we both thought this was excellent for a such a simple dish. The main dish, Grilled Peaches and Pork, was a little more challenging than I had planned on. The peaches ripened a lot faster than I expected, so trying to pit and peel them was kind of messy. The pork chops are first pounded thin and then marinated in a zesty mixture of Balsamic vinegar, fresh lime juice, thyme, salt and pepper. They are then grilled and sliced into thin strips. The peaches are drizzled with a bit of balsamic and are then placed on the grill. Since mine were pretty soft already, I didn't get a chance to get them distinct grill marks, but I was able to leave them long enough to start and caramelize. I just wish they would have been a little firmer for a better presentation. They had a killer sweet taste though and the balsamic was a great touch. The sprinkling of crunchy turbinato sugar before serving was a fun and different finish to the salad. Quite a bit to talk about tonight - so let's dive on in! I posted about the watermelon yesterday and I used most of it today in a drink called Watermelon Agua Fresca. 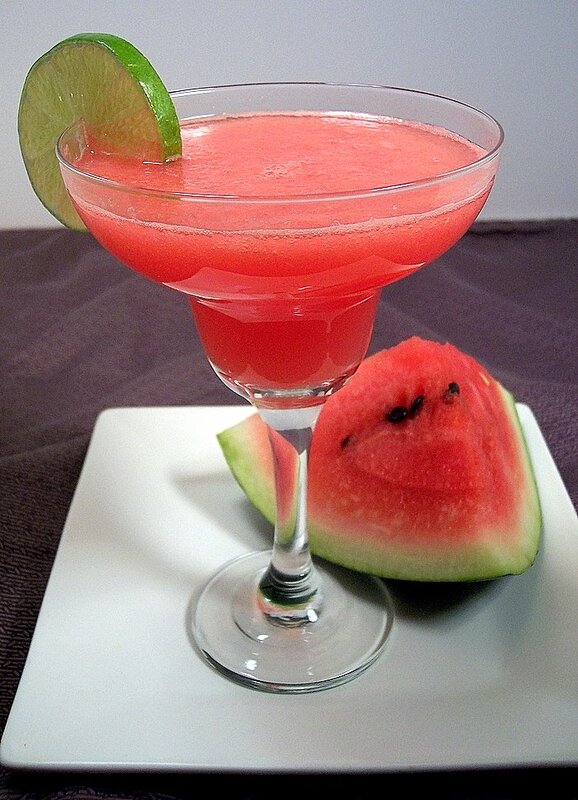 This vibrant red blended mixture of watermelon, sugar, water and lime juice is combined with chilled seltzer to create a fizzy and quite refreshing drink. 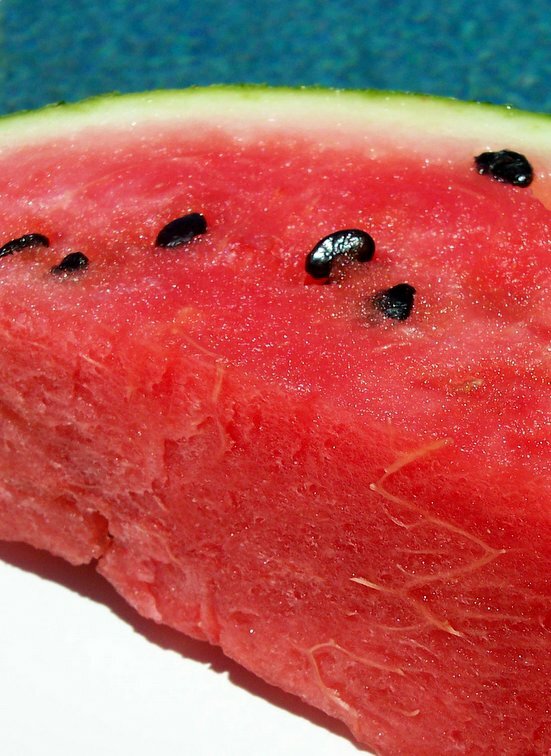 To keep the drink smooth, it is strained to catch any seeds or large fibers. This was a great way to cool down after doing yard work in 110 degree temperatures! Be sure to serve this well chilled - if you wanted to serve this with ice, you could make extra and freeze it in ice cube trays so the drink would not get watered down. 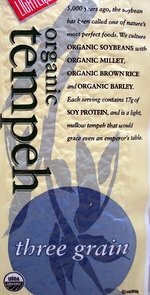 I was excited to make tonight's dinner as it called for an ingredient we have not used yet - Tempeh! 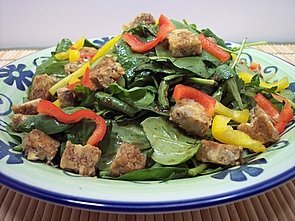 Green Salad with Grilled Tempeh and Maple-Soy Vinaigrette was a nice light dinner that came together pretty quickly. I had no idea what the tempeh was going to taste like, but when we sat down to eat we were both pleasantly surprised! It was nutty and slightly chewy which paired well in a lightly dressed salad. The tempeh was spiked with a mixture of pure maple syrup and soy sauce after being grilled until browned. The sweet and lightly spiced dressing brought together the spinach and bitter arugula. Red and yellow bell peppers added color along with a fresh crispness. We will have to try the Tempeh again in another dish! To go along with the salad tonight, I also made Parmesan Skillet Flatbreads. A combination of all-purpose and whole wheat flours with fresh grated Parmigiano-Reggiano cheese make these savory flatbreads delectable. They are mixed together just like any other bread dough recipe - but after being stretched thin, they are quickly cooked on the stove-top instead of in the oven. They only take about 1 minute on each side in a hot skillet and then you have warm, chewy and cheesy pieces of bread to have along side a salad or to just enjoy by itself! This will be made many more times! Just under 3 weeks to go before the movers come and pack up the house! This week was exceptionally busy as we started to deal with showings of the Phoenix house again (sigh....) We did talk about 7 new recipes, but I made 3 more that I just did not have time to write about yet. I don't think we could pick out any favorites from this week, they were all very good! I have a bunch more new recipes planned for this week and hope we are able to get to them. I finished the grocery list this morning and we were able to get just about everything - I wanted to wait on a couple items so they could be as fresh as possible. Here's a peak at a couple of the things we bought today that you will see used this week. Tonight's weekend DVD from Netflix is the animated film Valiant with Ewan McGregor and Tim Curry. Check back and see what we end up cookin' and bakin' from the kitchen! I was going through the freezer last night trying to figure out what I could get used up today. I saw a couple frozen bananas and knew I had a recipe set aside for them somewhere. It took me a bit to find the recipe in the monster known as "the stack" but I finally found it. Toni's Banana Chocolate Chip Walnut Bread is a moist flavorful bread and depending on what brand of yogurt and chocolate you use, I think could be considered vegan. The recipe uses whole wheat pastry flour to keep it light, but I think a mixture of half all-purpose and half whole wheat would be ok here. 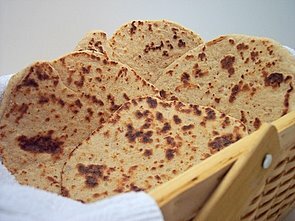 You could also use all white whole wheat flour if you have access to it. The banana flavor was pretty subtle even though mine were pretty ripe, so I would add a touch of banana extract next time. You can taste a hint of cinnamon and the amount was just right for us. I used mini chocolate chips as I find the distribution of them to be better in breads and muffins. To help the chips and walnuts from sinking to the bottom, be sure to coat them in a tablespoon or so of the flour. There seemed to be lots of fresh corn at the market this week, so I bought some ears without knowing what they would end up in. While we love to grill them whole, I wanted to try something just a bit different for a side tonight. Sweet Corn and Parmesan Flans have a savory and silky texture that mingles well with the roasted whole kernels. Roasting the kernels before using them intensifies the sweet flavor from the corn. The flan is a mixture of eggs, pureed roasted kernels, milk, seasonings and nutty Parmesan cheese. 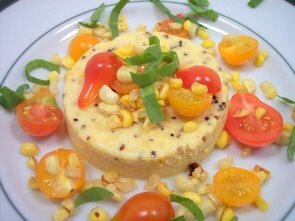 Colorful halved yellow and red cherry tomatoes add a vibrant freshness to the creamy rings of corn. *To help them cook slowly and evenly, the flans are baked in a water bath. Place a layer or papertowels or a dish towel in the bottom of your baking dish before adding in the ramekins and water - this keeps them from knocking into each other while you move them from/to the oven. To be safe, place the baking dish on the oven rack before adding the water to reduce the risk of sloshing hot water on yourself or into the ramekins. 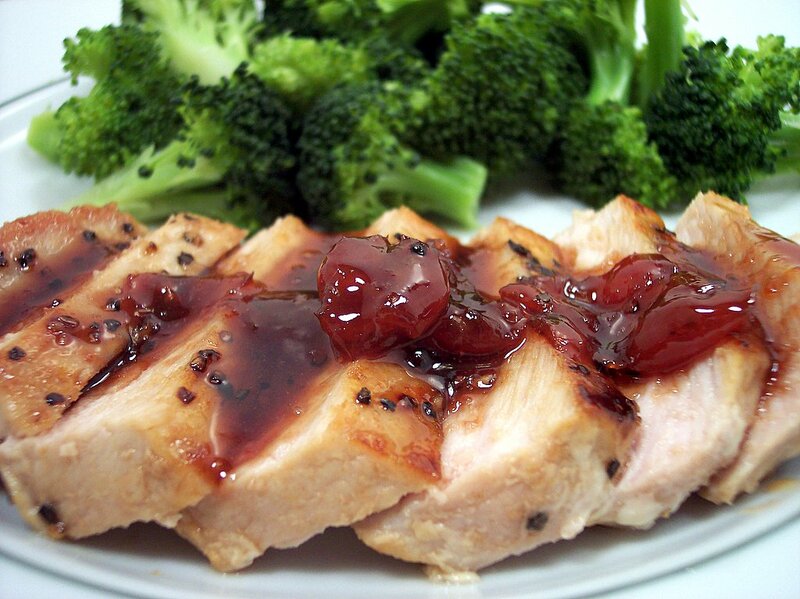 I decided to serve a quick dish of Pork Chops with Ginger-Cherry Sauce as the main portion of tonight's meal. To add a different depth of flavor to the chops, they are first sauteed in toasted sesame oil. Once they are done to your liking, they are removed from the pan while chunky cherry preserves are mixed in with soy sauce, vinegar and freshly grated ginger. After being allowed to reduce, the tender chops are added back in to warm up and start to soak in the flavorful sauce. The tangy cherry mixture may seem a little thin at first, but it starts to thicken up as it cools down. The sweetness in the cherries is tempered by the salty soy while the fresh ginger adds just enough of a snappy bite. I also steamed some broccoli as an additional side . Boy are we full and happy now! Needed some tinkering, but good in the end! 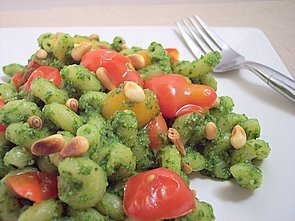 Cavatappi with Arugula Pesto and Cherry Tomatoes is a light pasta dish saturated in a peppery and nutty pesto. Corkscrew shaped pasta is the perfect vessel as the ridges are able to catch and hold onto the sauce. Upon first bite, I found the bitterness of the arugula to almost be overpowering, so next time I would use a bit more lemon juice or replace half of the arugula with spinach. The original recipe called for water in the pesto, but I used chicken broth instead to punch up the taste. To add another layer of flavor, I pan roasted the sweet cherry tomatoes in a touch of olive oil, just until they burst, instead of leaving them raw. 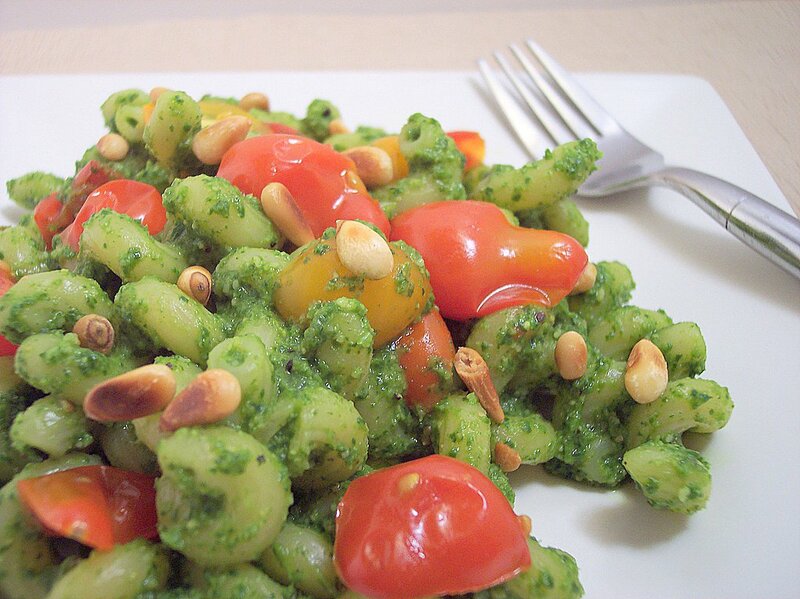 To round out the dish, a smattering of toasted pine nuts added just enough richness to pull together the flavors. Burgers are always a favorite around here, but they can be a little heavy when you want something light for dinner. Tonight's recipe fills that burger craving without leaving you feeling guilty. 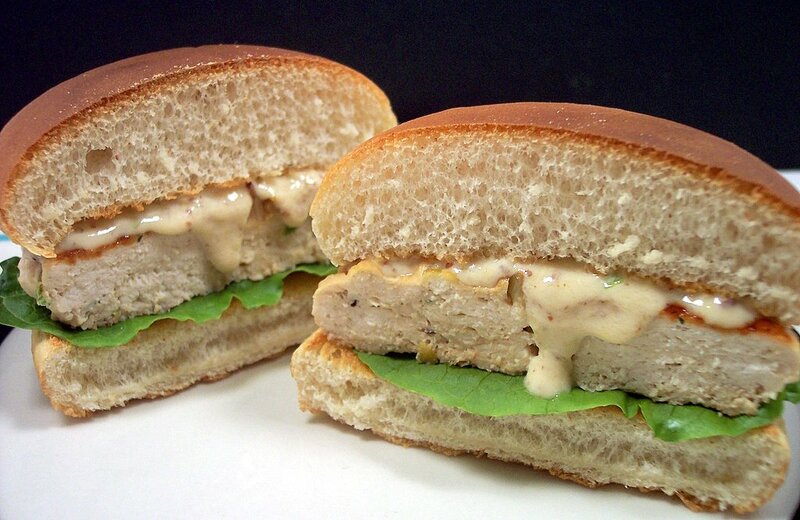 Turkey Burgers with Special Sauce has a few twists and turns to it that take your tongue for a fun ride. 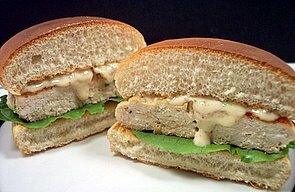 Sometimes burger recipes that use turkey breast can easily come out dry, but these stay moist by mixing in tangy sweet orange juice and soy sauce. Green onions, garlic and fresh grated ginger ensure these thick patties will not be bland. But what makes this recipe, in my opinion, is a versatile "special sauce" that will be made again and used to top other burgers. The sauce is thick, sweet, tangy, and the best part - it makes a generous amount so you can play around with it on other recipes. Jeff and I are eagerly awaiting lunch tomorrow so we can finish the other two off! On Sunday, we posted this picture and asked if anyone would toss a guess as to what they were. Erin was the one who guessed correctly! 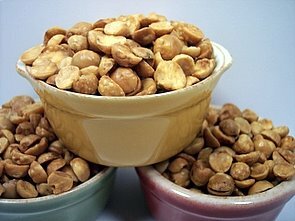 These are Avellanas, otherwise known as Chilean Hazelnuts! They came already skinned and most of them were halved - they seem to be almost half the size of a normal hazelnut too. When I went out looking to get some hazelnuts for the recipe today, I spotted these at Trader Joe's and had to try them out. I'm going to miss having a TJ's so close when we move! 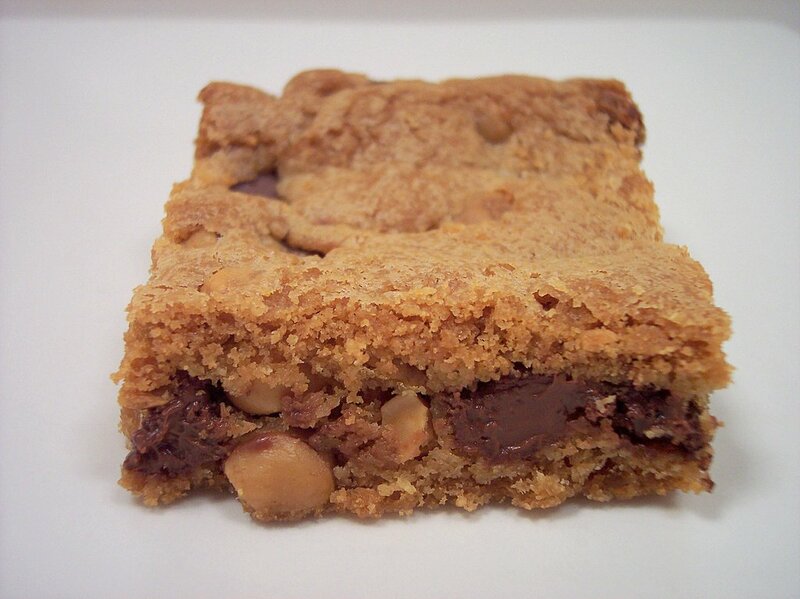 This bar cookie recipe, Hazelnut Chocolate Chip Bars, takes a basic chocolate chip cookie to an adult level. Two generous amounts of chips, semisweet and bittersweet, along with the Avellanas make sure that you have a variety of each in every bite. The Avellanas have an unusual sweetness to them and bring a very crunchy texture contrast against the soft chips. The bars themselves have a crisp outside (not crunchy) with a dense and almost a sticky chew as you work your way into the cookie. 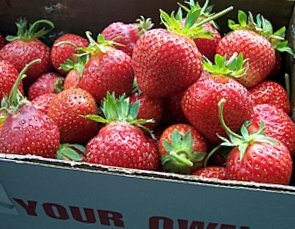 Be sure to cut these while they are still a bit warm; if you wait, they might crumble some and loose the clean outer finish. Treat day continues! Even though Jeff is no longer working at the Phoenix campus, it does not mean we have to stop with the Wednesday Treat Day tradition! We will sneak these bars over tomorrow morning and hope his former co-workers enjoy them. The new season of Hell's Kitchen starts tonight. We liked the last season and have been looking forward to seeing what this one brings. I can't imagine how stressful it must be to be in his kitchen! Anyone else going to watch? When it is this hot outside (108 today! ), it is nice to make things for dinner that do not require you to heat up the house with the stove. I made tonight's recipe in The Griddler, but this meal would be great on an outside grill. Spicy Jerk Chicken Kebabs with Bell Peppers and Pineapple are sweet with a spicy bite to them. To start off, cubed chicken breast is marinated in a pungent combination of toasted spices, brown sugar, lime, soy sauce, Worcestershire, paprika, thyme, garlic, shallots, fresh ginger and jalapeños. I left the jalapeño whole to pump up the heat, but if you want a more mild version, seed them before using. 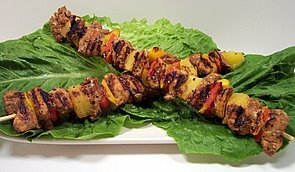 For a fun flare, diced pineapple in addition to chopped red and yellow peppers are threaded onto the skewers between the juicy chicken breasts. As the fruit and veggies caramelize, the sweetness is brought to the surface. When you reach a piece, it helps to calm down the bite from the racy marinade. 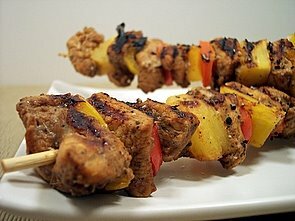 *If you opt to use wooden skewers, be sure to soak them for a bit in water to reduce the chance of charring them. We had 6 new recipes posted last week, which is pretty small for what we would normally talk about. Since we are home for the next 4 weeks, expect the number of recipes to increase to about what we used to do. 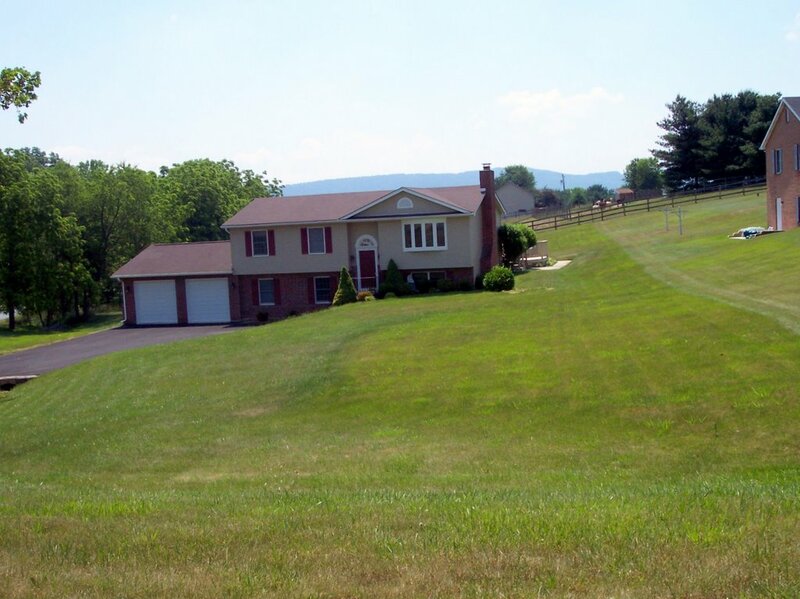 The countdown to the big cross-country move is on; 27 days until we fly out to Maryland for the last time and wait for the packers to bring up the stuff from Phoenix. Thankfully, US Airways came through and actually delivered our missing luggage to us this evening. Whew! Since we have been back and forth to Maryland for the last month, we had nothing fresh in the fridge... so today we did a pretty big grocery shopping trip. We picked up a couple new-to-us items and here is a quick snap from one we will be using in a sweet item later in the week. Care to toss a guess as to what these are? I waited until this morning to get the menu planned out for this week. I picked out some recipes that I'm sure will leave Jeff saying "Oh god, what are we trying now!" Stay tuned... lots of fresh ingredients will be showing their charm this week! Well, after another long 5 hour plane ride and a 2 hour wait to find out one of our bags (along with 78 others from the DC flight) were not going to be at the airport tonight, we are back home in Phoenix. Hopefully this will be the last flight until we go leave for the final time. The move is scheduled to happen mid July, so that leaves us with plenty of time to get our extra pantry items used up! The one thing I will definitely miss is our walk-in pantry. The new kitchen is probably half the size of our current one, so until we have the time to renovate it to our liking, it will be an interesting adventure getting used to the smaller space. 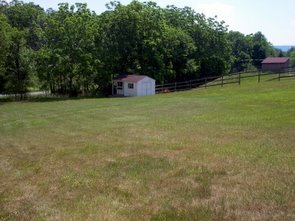 If we could have only moved some of the kitchens we saw into this house… but we had to compromise on something to get the acreage we wanted. By the time we arrived home, we were pretty tired, but I had been itching to get something made in the kitchen. I opted to go with a no-fuss quick dinner, that again, uses up some pesky pantry goods. Sloppy Joes with Corn uses canned corn, but since it is that time of the year, use fresh sweet corn if you got it! Ground sirloin makes up the main portion here, but I would not hesitate to use some ground turkey breast for half to lower the fat some. Once the meat has started to brown, thick tomato paste is added for richness and does a good job of holding the mixture together. Smoky cumin and chili powder add that classic smell of sloppy joes I remember while growing up. A dash of cayenne brought the heat up to a respectable level, but you could add a dash or two of Franks Red Hot and I wouldn't mind! After the mixture is thinned with some chicken stock and allowed to simmer to concentrate the flavors, corn is stirred in to add a different texture to your ordinary joes. This made a generous six servings, so we opted to save the mess and have them open faced. The sweet item I'm posting about today is one I made before we left for Maryland last week. 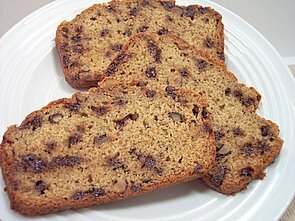 I have had this one in my to-try stack for a long time and in looking through the pantry, we had just enough plump golden raisins to get used up for this recipe. Raisin Spice Bars have a dense and chewy texture that is somewhere between a cake and a cookie. The spice part from the recipe name comes from a delicate and fragrant mixture of ground ginger, Vietnamese cinnamon and allspice. 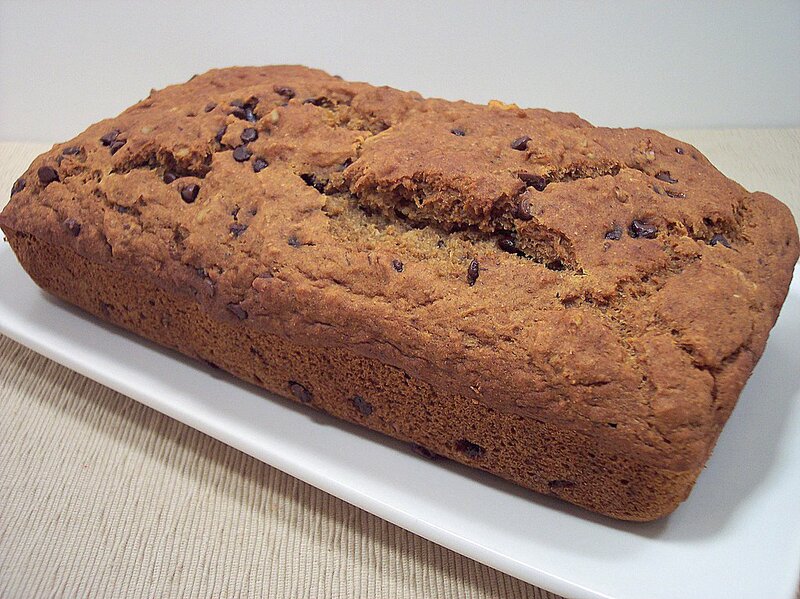 An in-your-face deep and rich flavor comes through from thick molasses. I used chewy golden raisins, but I bet you could get away with chocolate chips or whatever mix-ins you like. I did enjoy the fact that even though these are baked in a 9 x 13 baking dish, there is only 4 tablespoons of butter, which helps to keep down the calories. On day one these bars were pretty good - but as the spices assimilated into the bars, they grew much more flavorful and had a more moist crumb to them. I had some Jasmine rice to get used up last week, so I went searching for a side dish I could make to go with dinner. I wanted something that would not have to be constantly attended to or too fussy. Rice Pilaf with Toasted Almonds looked like it would fit the bill. After browning minced onions in butter, I added in some aromatic Jasmine rice to first lightly toast the grains. Once the edges started to turn clear, chicken broth is added and the mixture is left alone until the rice has soaked in the flavorful liquid. 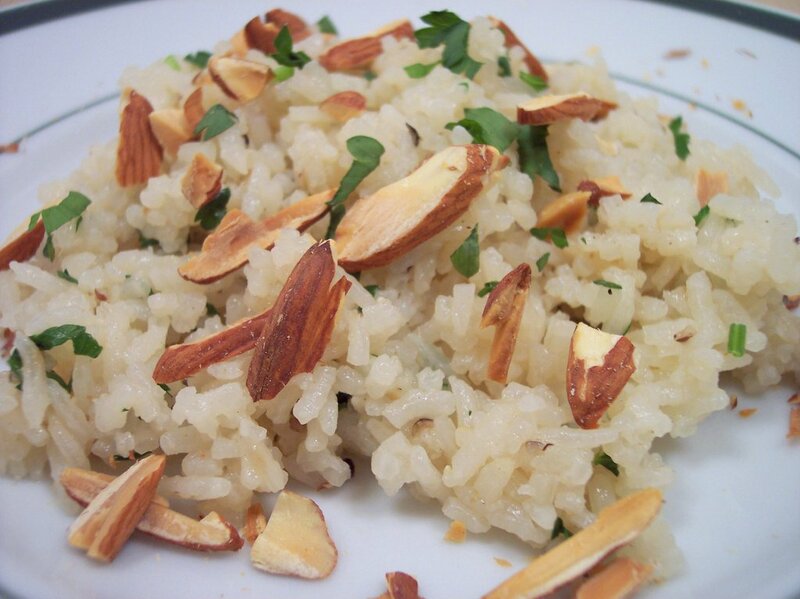 Toasted almonds scattered on top at the end bring a crunchy and nutty texture to the fluffy rice. Since simple flavors were used, the flowery aroma of the rice is allowed to shine through. The finished dish was a bit more creamier than if we were to have used plain long grain rice I think. This easy side will be repeated with many dishes I imagine! In a large bowl, whisk brown sugar, melted butter and eggs. Stir in figs, cranberries and vanilla. In a medium bowl, whisk together flours, bran, baking soda, cinnamon, and allspice. Add flour mixture to egg mixture, stirring just until moist. Gently fold in almonds. Measure the dough out using a 1/4 cup measure and place on parchment lined baking sheets at least 3-4" apart. Sprinkle each with a heaping 1/8 teaspoon granulated sugar. Bake until just set in the center, about 10-12 minutes. Cool 2 minutes on pans. Remove and place on a wire rack to cool completly. Let's talk about some good news we have to share and then back to the food! 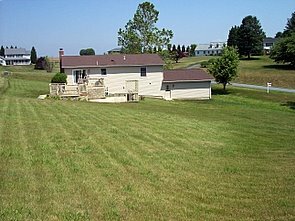 We put in an offer on a house in Maryland and it was accepted! We went through the home inspection already this morning and there were no major issues! We took some pictures to share.... Remember to click on them if you would like to view bigger pictures. And a view from the back... Can you guess what probably sold Jeff the most on this house? Our neighbors directly behind us have animals.... and not just any kind - right behind our fence are Alpacas! There is even a good sized shed that matches the house in the back corner! 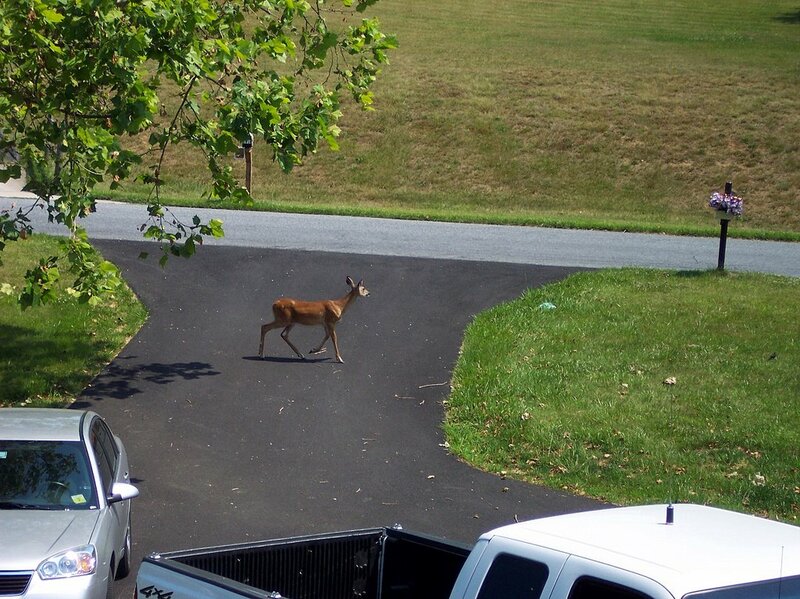 Have you ever seen that Chevy Chase movie where they release some deer when they try to sell their house? During the inspection this morning, guess what I saw wandering around our house and driveway? Hmm... I wonder if someone set that up - hee hee! The movers will be coming to get our stuff from Phoenix the second week in July and we should close on the new place shortly after that. The ball is starting to roll and it seems to be going quite quickly now! It's too bad I feel like crap to enjoy it all (I've had a sore throat since Monday... sigh) - but I guess I shouldn't complain! Sorry about that - we can get back to the food now! 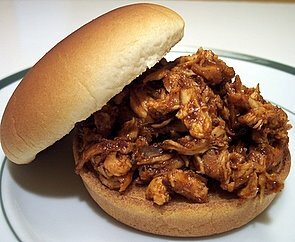 One of the dinners I made before we left again was Pulled Chicken Sandwiches. This has so much going for it! The chicken is first rubbed with a flavor-packed combination of spices and then grilled off until done. 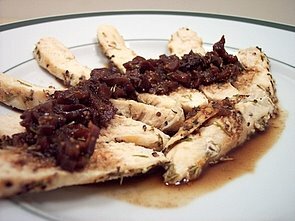 I used chicken breasts for this, but the original recipe did call for thighs - feel free to use what you like! 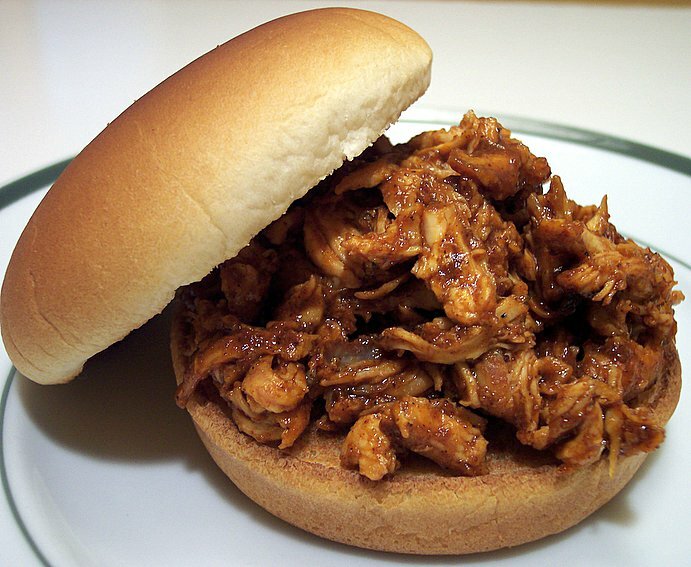 Once cooled enough to handle, you shred the chicken and reheat it in a slightly sweet and spicy homemade barbecue sauce. The sauce was just so good that I will be repeating it for other recipes - just enough vinegar and spice to punch up the flavors. 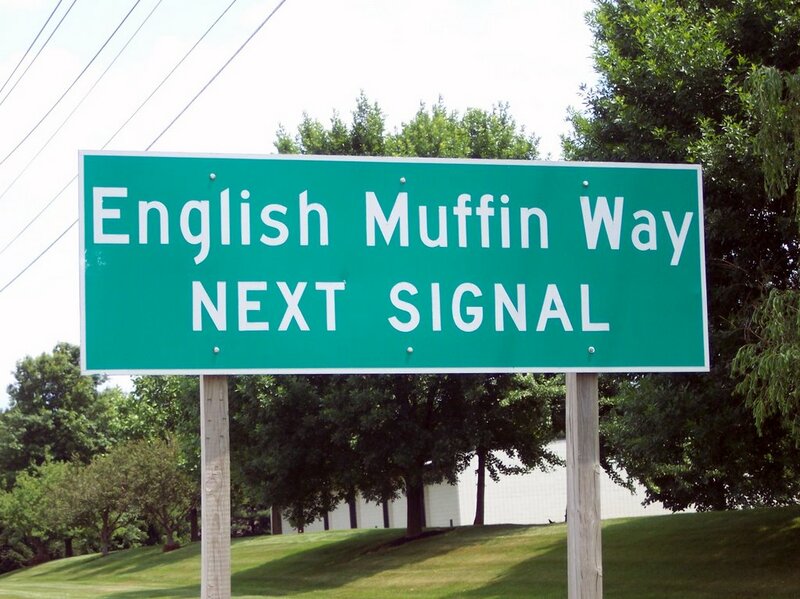 We had them on plain buns, but go crazy and dress them up if you so please! I asked Jeff if he thought we should make something to bring for the new co-workers and give them a little preview of what would be coming when we start their Treat Day after the move. He thought it was a good idea so I needed to find something that would survive the plane ride and not go bad. 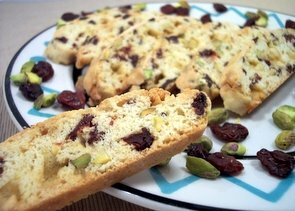 Biscotti was the first thing that came to mind, so I went through my recipe stacks and picked out Pistachio, Dried Cherry and White Chocolate Biscotti. 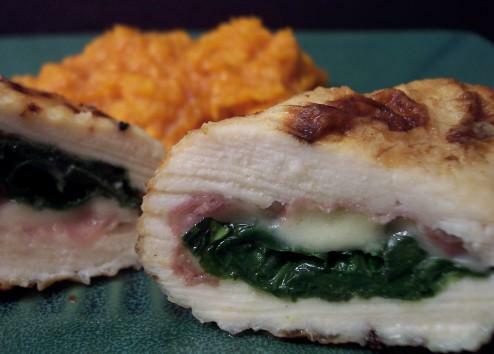 This recipe is similar to the many others we have made, but with a lot more mix-ins! Green pistachios, chewy tart cherries and chunks of sweet Callebaut white chocolate. The dough was a bit sticky, but if you wet your fingers before shaping, it was much easier to work with. I let these cool for much longer than I normally would in hopes of having them cut without breaking as much as they sometimes can. After about 25 minutes I started slicing with a serrated knife and was very happy with the clean cuts! The biscotti are pretty crisp, but do not require dunking to be enjoyed. The day before Jeff was going to head into the new office, we went out to explore Frederick a bit and we came across this sign! Which was, coincidentally, right next to this one... Hmm.. conspiracy to increase the Jam sales maybe? We had to stop and check out this place - Mayne's Tree Farm. Apparently they also offer a ton of other fresh vegetables and have different events going on throughout the year. We were running late already, but there was no way we were going to pass this up! 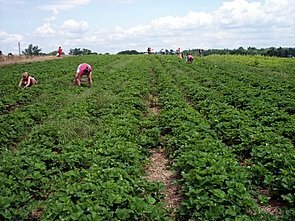 Here is a shot of one picking field. 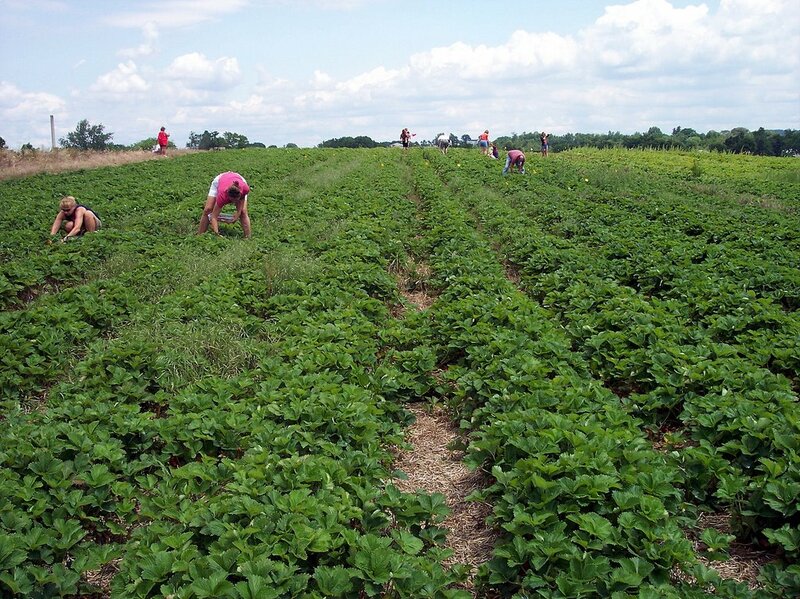 Here are some of the sweet and deep red berries we were able to pick. We picked an overflowing 4 quart box and paid around $6! As we got back to the hotel, the intoxicating smell of the berries quickly filled the room. 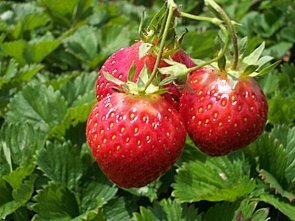 Since we had so many, I started to think of what else we could do with the strawberries. We went out later and got some good quality white chocolate and proceeded to put the microwave in the room to good use! 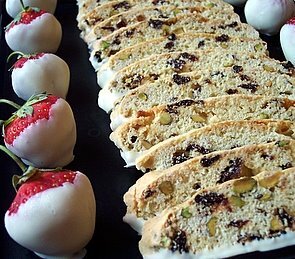 I melted a bit too much so we went ahead and dipped the bottoms of the biscotti as well. This added just the right amount of a subtle creamy sweetness to the crunchy slices. Hopefully the new coworkers enjoyed the treats we brought in - not bad coming from a hotel room (well we did bake the biscotti before we left). 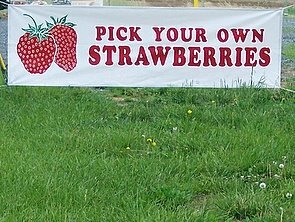 The fresh strawberries were just too good not to share, even though Jeff tried to keep them all for himself!